Patient: Boy aged 8, weighing 20 kilos. Height: 112 cm. Chief complaint: Lack of gain in height and weight. Reports show a growth hormone deficiency. 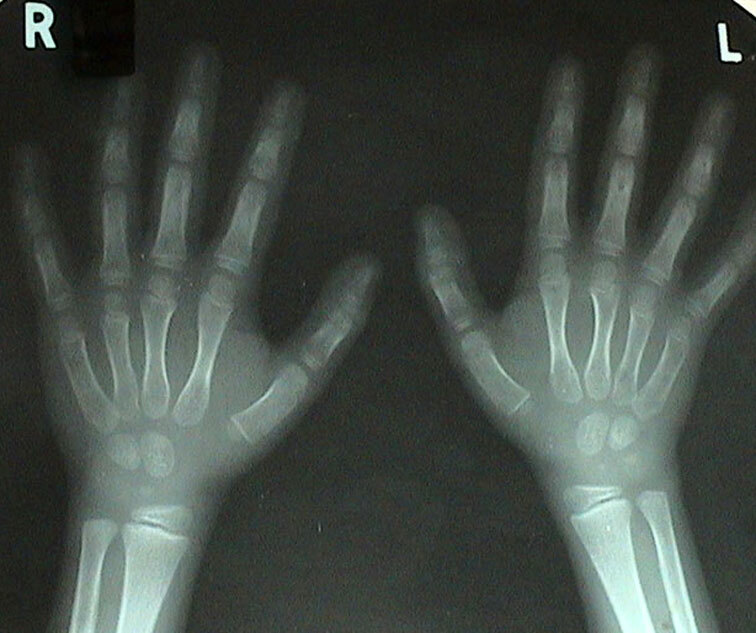 X-ray of the carpal bones show bone age of 4 years. 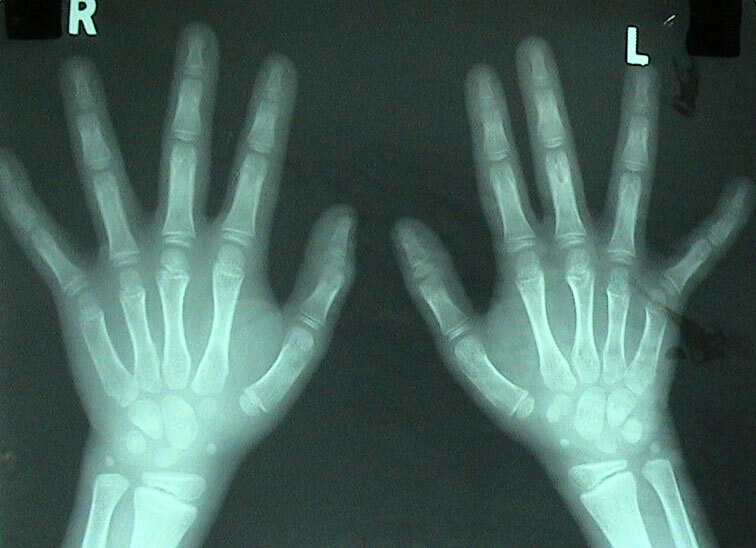 It shows only 4 carpal bones at the wrist joint that correspond to bone age of 4. “ Why are you worried so much, I don’t feel a problem being shortest in the class? I don’t want to take injections everyday. Why don’t you take me to Chetna aunty who treated me before”. C: Tell me everything about him, the most minute detail if possible, don’t think whether it is relevant or not, whether I need it or not as information. Whatever belongs to him is relevant! Fa: We first realized he had (a problem)…he had headaches and he was found to have a weak eyesight at the age of 4-5 years. He had constant headaches. Than at 5 we realized that he is not having a height and weight like that of other children of his age. Even now at 8 he is not…he is only 19 kilos. 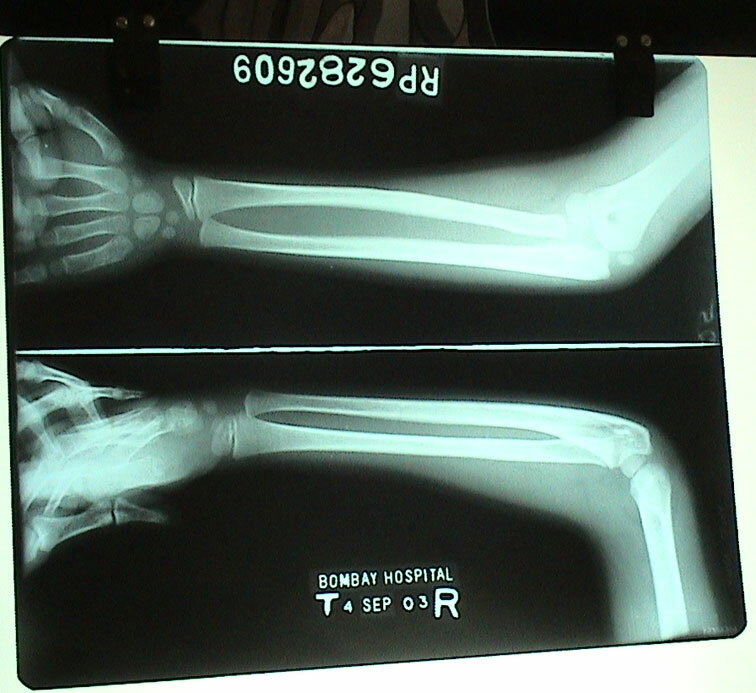 We took X-rays of his wrist and doctor says his growth hormone is not normal. His bones are at 8 years only 4 (corresponding to that of a 4 year old!) but he has a beautiful mind, ideas! We have no doubt about his intelligence. Only his growth and height. He will be 9 in august and he is only 20 kilos. He swims well, does high jump, underwater swimming…! He eats everything-Italian, Chinese, Indian cuisine. But we realize when we have visitors that other children of his age eat more. He eats everything but he cannot even finish a 6” pizza. An 8” he can hardly eat 3 pieces. He has never finished! He had earlier leg pains. Now also he complaints. Yester day he walked hardly 3 kms from our house (in fort) to Gateway of India and it pains him still. C: Where does it pain? Ch: (raising his leg and pointing at the shin bones). Fa: May be he has no habit of walking, all the time he is used to car and motorbike! But he plays cricket and he does not complaints. He is good at it, he bowls well but he is not good at strokes because of the weight of the bat. He plays tennis. At the end of the day he does complain of pains. His capacity is small portion of work and food. For breakfast he eats a small toast, some fried snacks (ganthiya, paapdi) and a small glass of milk that he does not like. C: What you like very much? Mo: fruits, all he eats. C: What you like very much (to the child)? Ch: (smiling) All fruits! Litchi, papayas, and watermelon. Fa: whenever we go out to eat he eats orders watermelon. He is not keen on chocolates and ice creams. He likes candies but not milk. Mo: He likes methi (fenugreek leaves). With bitter he has no problems. He likes everything. He is not fussy but quantity is less. He says don’t give me much I can’t finish. He is close to his parents (them) because of no children around. He does not like to sleep alone outside with our parents. I have not experienced that he is stubborn. Mo: For just a minute he gets stubborn and than he comes around. Like he wanted to go to swim yesterday and I was tired. But he never understood, he wanted to go. I told him we have been everyday. But he started to cry. He felt bad he cried. I said go with your aunt. He refused, always mom and dad has to go with him. Fa: In front of others if we tell him anything he does not like. Last exam he got 82% and she was telling somebody over the phone that he is not doing well in studies. He was quiet hurt. He sat in a corner and started to cry. He expressed why you exposed me in front of others, I did my best and I got 82%. Maybe other children are more brilliant than him but he is good in all other activities also. Last year in G.K (general knowledge) he did very well. Mo: Before he got 85% and now he got 82%. I want him to do better. Fa: He likes to read books. I have 1000 odd books he sits and reads them I don’t get time but he reads it. He is always active he does not sit idle for even 5 minutes. (Meanwhile the child had put all the animal toys from the box lined well on the table.) It is “Jumanji” all animals queued up! Mo: He often says I am bored. He wants to be busy do something the whole day. He makes family tree-mama, papa, grandfather, and grandmother with picture games. Fa: He goes to computer, goes on the Internet, copies pictures, pastes etc. I have never taught him anything. He learns on his own. He types well on the computer, he SMS’ me “papa I feel lonely!” He sent to me this time…what you sent to me? Mo: He writes sayings from books. But he erases the message from my mobile after SMS-sing him. I must not read what he writes to his father. Fa: He has a very good memory. He likes to travel with me see birds, flowers, and gardening. I have never seen him watching television. Mo: After a movie he says he gets a headache. He cannot sit for three hours in a movie. He says he gets a headache. We saw Harry potter but he cannot sit for a long time. What did you SMS the other day to him? Mo: His father is too busy so he wanted to probably say that you would die working too much. That too much work will kill you! Ch: Not that, it means that my papa will die but will never say a lie, never do a wrong thing! He feels lonely. He thinks of him at 12 in the night, dinner, lunch…he wants him. C: You are papa’s boy? Fa: He likes old movies, “Sound of Music” , “ Good Bad and Ugly” . He knows all the songs of the sound of music. He can see them repeatedly. He likes true stories, non-fiction, and war movies; than he asks, “Did this really happen?” He would not like “Star Wars” but actual war movies like “Top Gun” . C: Which is your favorite movie? Fa: It is Vietnam War movie. He likes true stories. He likes old Hindi movies. It interests him, like “Pakeezah” , he likes the songs of this movie. All old songs he likes. He does not like today’s songs. I have a limited collection of old Hindi movies of the 60’s he likes them. They are with a plain culture, not much music, not many people. Like Pakeezah had only two characters. Fa: He likes adventure sports. He likes to go to jungle. At 5 years of age he climbed 3000 steps of Paalitana (a pilgrim place of the Jains on a mountain with 3000 steps to reach there) he also had different reasons but he did climb. He does not like to be carried by ayahs, so he did not go to anyone and he climbed all the steps. He does not like to be touched by others he is like me. I am also reserved. He is active. Everything is fine but his growth. At this age he has learned 3 months piano, skating, cricket, tennis. He does a lot of activity. He plays good chess and carom board. He has defeated me in chess. He plays golf too. I can say but that he is Jack of all Master of none! C: What is he really good at? Everyday evening he goes. The first day the instructor asked would you jump without the float? He said yes and did it. Than he realized that he could do it he started jumping, than he did underwater. I have noticed that he notices and than does on his own. If someone prompts him he doesn’t. He is reluctant to ask. May be his choice or afraid. He may never ask you for a glass of water he would rather take it on his own. We bought this game…all children learn by themselves, yes but he has never asked for a query. He has never asked for learning. He has never asked that I am stuck, how will I come out of this? Never! Yes general questions he will ask about advertisement or something but never a query! About learning he never asks. One day he asked me which are the three TOP hotels he said Taj, Oberoi and President. He is quick, witty to answer. He answers immediately. He understands quickly what we want to say. He is sharp. Mo: in studies if he knows his stuff than he does not pay attention. And sometimes he gets overconfident and he makes silly mistakes. Fa: I have noticed that he does not like to be defeated. Than he says “papa you cheated” he starts to cry. C: Papa cheats (to the child)? Fa: may be with them he does not do since with them he cannot do. He comes and says that today he scored the highest runs; today he got out in zero. These days he wanted coaching in cricket. Mo: He finds his activities alone. When he has finished with all his activities he remembers his father. And when he thinks of him he starts to cry. He looses a lot of his things, is pencils, his rubbers in school. He does not keep his things properly. He is careless. He is in a hurry to finish his studies and goes out to play. At sharp 7 he has to go out. He tells his teacher we will do it tomorrow. He just closes his books and goes out. I know everything! He makes silly mistakes. He writes sometimes very good handwriting and sometimes bad. In between he used to get a lot of abdominal pain and we found out that he used to remain hungry waiting for his father. He gets late for lunch, he comes at 2-3 in the afternoon and he got acidity. So I told him I will send you tiffin and he will eat in time at 12 noon since than his abdomen pain is not there. For that he was put on a lot of allopathic medicine but than we found out. He says he wanted to come to you. He said take me to Chetna auntie. He did not want allopathic. C: What about the pregnancy? Fa: Yes, we went for treatment. We were eager to have a child early. We went to the Gynecologist. She took her treatment for 6 months. In the last month she was put on hormonal injections. She was given medicines to stimulate her ovaries. So many tests, than we gave up. Everything failed for 6 months. The last treatment they said the effect will last for 4 months. They gave me some medicine that would stimulate her ovaries to make good eggs. My counts were normal. Than when he was born…we saw him…we felt he was not a healthy child! He was 6lbs. We didn’t feel good about him on seeing him! Fa: he looked like a Chinese! Fa: We have seen a lot of doctors for the eyes, teeth, endocrine; we went to Poona, and now you. In the last 10 years we have seen 35 doctors! C: You would have liked? On his birthday we go to donate poor children he says why don’t you adopt one? Fa: (To the child) What do you think, why are you not growing in height, your brain is fine? Mo: he eats everything good, all vegetables, nuts but no weight. Everything is slow. He starts now…to sleep away from us. He is slow in everything, weaning from us, from…! Fa: He is attached! But he has a great sense of humor as compared to other children. He is active. He has not seen other houses, other children’s houses. He does not go to stay over night anywhere. His friend is 27 kilos and tall! If we call him short he says I am not short. There is one boy he is short like me. Fa: I don’t think he has any inferiority. He has friends from higher class from the 8th, 10th even girl friends. He is doing well in school. He has a good sense of humor. No best friend in class. His best friend is my friend. He was short till 17 and than in one year he shot up by one feet. He never believed that we should do all these treatments go to the endocrinologist. He is the most brilliant in our group. He says, “He is like me”. He was also like this. He (child) has a strong will power and sense of humor. No! I taught him first-Fearlessness, Egolessness and Timelessness! But we think he has fear of being defeated. If he sees he is losing…he sees in the game that now only three moves and he is left with only king and bishop, he is losing…at that time he is in tears. He will stop playing. That I call fear! C: (To the child) Shall we talk alone, shall we send your parents outside? C: What is this that you cry when you are defeated? C: What do you feel when you are losing? C: When else do you cry? Not on other occasion, only at these times. C: What will happen if you loose? C: *If you win and the other looses and starts crying, what you feel? I don’t feel nice for the friend. If there is a match than I am o.k. if I loose. If there is no match and I loose I don’t like. I also don’t like if the opposite person looses. C: What else you don’t like? Yes. Cricket. I used to dream of stories told by father. Stories of god! Now I don’t know. He does not tell me any more. The other day he was telling me and I went to sleep. C: *What and why you like god stories? How God becomes God! How god takes “Diksha” (renounces the world). C: * How can one become a God? C: *You want to be one…? Yes I want to take “Diksha” and become God! C: *Which story had this? To take “Diksha”, you have to fast for 2-3 years, get nails pierced in the ears…than there will be an lightning from the sky and an angel will save you from getting nailed and than you become a God! …you don’t wear footwear, fast for long times. No I feel like doing but mom does not allow me to do it. C: You will fast, take “Diksha” than there will an announcement from the sky by an angel and Chinmaya (his name) will than become like Mahavir? C: What you talk to God? Nothing, I think of these stories. C: If mom allows you to fast, how many will you? Yes, I will do 1,2,3,4,5,6,7,8- In “Paryushan” you fast for 8 days. 8 are good, than you go for “Pratikaman”. Not to eat anything, but water is allowed. C:*You want to take “Diksha”? (Thinks) No! It is very hard. You have to go walking everywhere- from here to Poona also! One can walk but my legs pain. You have to walk in the sun. You have to walk without shoes, you don’t have to let hair grow, and you have to pull them out on your own. It pains! C: *If you get to become God without having to do all this than? C: Whom do I call, your mom or dad? C: (To the father) he is religious? His ideas and mind work on truthfulness, religiousness and giving away! Mo: yesterday we went to the cake shop. He came to me and said I want 5 rupees. I asked why? He said he wants to put it in the charity box to help the blind. He gets donation cards from school for the blind. He says he won’t go to ask for donation from anyone and fill this card. He will instead put all his money from his piggy bank! He put all his collection for them in different names in the card. He had around 600 rupees he put it all! He does not like to ask from others. Even for food he does not ask, even if he is hungry! But this year I insisted he must go to everyone…but he went with me but never asked, I did the asking! He is not bothered of hunger. But after swimming he feels hungry than he asks for food. In school he does not eat at all. He wants to play. Yesterday it was the 1 day of moon phase and in our religion (Jains) we don’t eat greens on the 5th, 8th and the 1 days, he told his father yesterday “why did you eat outside it was 1 day”! He knows all this. He goes for religious studies. He knows the entire dos and don’ts of and for soul salvation. He fears to do any sins. He fears what will happen in next life if he does a sin, or if he lives by virtue. He reads stories related to virtue and go to hell. He says if I sin I will go to hell and if I live by virtue I will get heaven or get born somewhere as a king. He is curious to know all about heaven, Moksha etc. even I don’t know the deep knowledge of Jainism since I am not a Jain, I am a Vaishnav. He needs to know about religion in depth, everyday one story from the Ramayana, Mahabharata…anything! Yes he does not like to sleep with females-his grandmother. He will sleep with his grand father. He often says he feels like taking “Diksha”! Fa: He goes for satsangs, goes to listen to wise men. We have this priests who don’t wear clothes, don’t touch money-the Mahatmas. They live will power, on truthfulness, and purity. He says he wants to live like this. He will also never kill anyone. He loves to dress up their way, going to the Derasar (Jain temple). Mo: he says he wants to take Diksha, but his father should join him too. He tells me you don’t take but you come to meet us with grand mom. C: Will you take Diksha (to the child)? Fa: Of course he is religious! Mo: I don’t allow him to fast. He is small. I can’t see anyone fasting. They are nearly dead at the end of the day. I force him to eat. But he does fast. Once I took tiffin to his school but he never ate, he had decided to fast. After 7 he does not take water at all. In school they give potatoes. He does not eat as it is not allowed in our religion. He will remain hungry. C: What fruit he likes? Papaya and bananas. He can eat two bowls in lunch but than he has loose motions. Fa: If you tell him this doesn’t suit you than he won’t eat. He is very religious. He is not having a height and weight like that of other children of his age. He had earlier leg pains. Now also he complaints. His capacity is small portion of work and food. He likes all fruits! (Litchi, papayas, and watermelon). He makes family tree-mama, papa, grandfather, and grandmother with picture games. He does not like to be carried by ayahs, so he did not go to anyone and he climbed all the steps. He is always active he does not sit idle for even 5 minutes. I have never taught him anything. He learns on his own. It means that my papa will die but will never say a lie, never do a wrong thing! He likes old movies, “Sound of Music”, “Good, Bad and Ugly” . He likes true stories. They are with a plain culture, not much music, and not many people. He is quick, witty to answer. (Mo) If I ask him to and bring something he will say that my legs are paining and if I say mine are too I do so much for you all the time and you don’t do this much? He will say I will go and get it, my legs are paining but yours are paining more than me! He has not seen other houses, other children’s houses. He does not go to stay over night anywhere. I taught him first-Fearlessness, Egolessness and Timelessness! He has fear of being defeated. If there is a match than I am o.k. if I loose. If there is no match and I loose I don’t like. I also don’t like if the opposite person looses. I used to dream of stories told by father. Stories of god! I like God’s adventures! How God becomes God! How god takes “Diksha” (renounces the world). …“Diksha”, fast for 2-3 years, get nails pierced in the ears…than there will be an lightning from the sky and an angel will save you from getting nailed and than you become a God! Yes I want to take “Diksha” and become God! (Thinks) No! It is very hard. You have to go walking everywhere- from here to Poona also! One can walk but my legs pain. In his case his voluntary narration clearly defines the real person that he is. The questions with an asterix (*) indicate his real self being unfolded. There is hardly any disguise given to him by the subconscious, and that is not impenetrable. He is outside more or less the same as he is in his inside. There is already an Internal Consistency established by him for himself. But to confirm the same the parents when questioned in this aspect helps us confirm the Internal Consistency that we have established. …the internal consistency gets established! He fears what will happen in next life if he does a sin, or if he lives by virtue. He goes for satsangs, goes to listen to wise men. Individualizes to: Ficus religiosa given in 30 C.
The whole gestalt pointed out to this little boy trying to attain the supreme path in life, trying to reach the higher purposes of existence, to be like God, to be God (may be). Having proved two trees-the Elaeocarpus janitrus (Rudraksha tree) and the Mangifera-Indica, I was in my energies open to the vibrations of the trees. The Elaeocarpus I knew had the conflict of whether to be a family man or a holy man-and trying to find a balance between sexuality and spirituality. The mango was totally different-it was all about love and devotion. He needed something divine, something sacred in its quintessence! Was it the Sacred Basil, the Buddha tree or the Bael tree, from the trees that I have known (Ã‚Â§ 4- Knowledge of medicines)? Fortunately for the patient and me I had prescribed it before and I had read books on the mythology of Indian trees. I had read about all trees- the folktales and mythology surrounding them. Belonging to India I know the story of the Buddha, why the tree had this name, and the folktale surrounding this tree. Folktales I believe are not mere superstitions, or baseless theories. They are based on scientific observation made by the primitive men who were more in resonance with nature than us. 8. Connected to and with God (he chose me and gave me the confidence to treat him). On closer look at the case I realized that this boy is living the Eight-fold path of the Buddha (very much like their Jain God Mahavir). Ficus in minute dose will help him cross the gulf the way it helped Buddha attain his enlightenment. No! But sometimes I get. C: As severe as before? C: Why, you don’t want to be like Mahavir? No. He was a big man. I am small. I can’t fast. Now I want to be a car engineer. C: You don’t want Diksha? After I retire as a car engineer I will take it (Coughs). Mo: morning he coughs and than he vomits. His appetite is better. He is taller. He had headache in between because of bad cold and cough. He was sick and he does not like noise. In school too he does not like children running around, making noise. He says he gets a headache. He likes loose clothes-pants and shirts too. They are drooping down his shoulders. It is comfortable he says. He does not like tight fitting clothes. Even nightdress he wears very loose. But he stretches so much that he tears all f them from the middle-all his pants are torn. Now he does not complaint of leg pains. But if he sleeps in the air condition he gets pain. This time he didn’t fast. None of us did. His grand mom did 8 days. Sunday is his birthday. He says he will fast on this day. Now he does not want to go for religious studies. But he still donates. Now he says he cannot concentrate in religious studies. He says he can’t concentrate and memorize the shlokas well like before. So he says he does not want to go there. He is getting mischievous and so the teacher shouts at him and he does not want to go there. But he does the prayer-‘Samayik’ (in temple) in which you have to sit with out shirt in one place without moving for 48 minutes. When you do this, girls and boys sit separate and they cannot touch each other. This time they did it with the head priest. C: How is he with children? They are all going on a camp but he does not want to go. He cries. Last year he said he would go this year. But now he says a no. This time they are staying in a 5 star hotel he says he does not like that. He likes to live in a jungle, in huts close to nature. In September we are going to Malaysia and we are not taking him. His father was talking to somebody on the phone that we are going alone. He started to cry and was not telling us. Than he told his father don’t keep telling everyone and reminding me that I have to stay alone. I feel sad. He fractured his arm during play (that he indulges in now excessively) and fractured close to his elbow in September 2003 (X ray 4th Sept 2003). The same revealed the growth of the carpal bones! The first directly indirect sign of improvement in the chemical production of his Growth hormone. 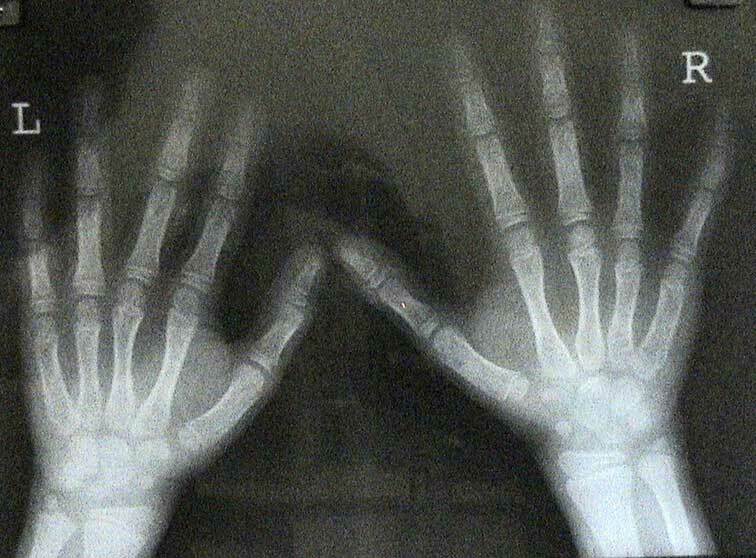 Any fracture is defined as a break in the continuity of a bone. This implies a need to break a set pattern of thinking/living/being! 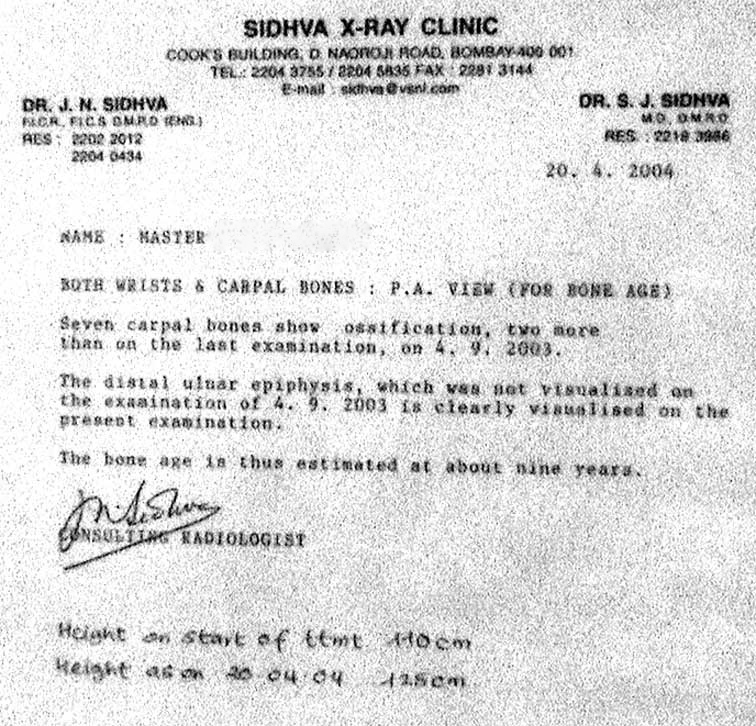 By April 2004 he had 7 carpal bones in his wrist. The child is no more the shortest in his class. He does not want to take “Diksha’. According to his mom, he wants to play most of the time and so he is not regular with his religion classes that have more or less stopped. He does not insist on fasting anymore and eats well! On asking him his dreams, he said he now gets dreams of sports! His measured height was 136 cms. 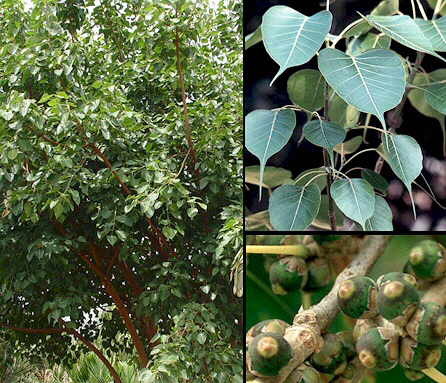 Ficus means fig and religiosa shows that it is venerated. The Sanskrit word “Asvattha” means under which horses stand. Bodh means the tree of perfect wisdom. The Peepal is the oldest depicted tree in India. In Vedic times it was used to make fire by friction. Considered a sacred tree it is seldom cut. It is associated with the triad, the roots being Brahma, the stem Vishnu and each leaf being the seat of a minor god. In another myth, Vishnu was born under a Peepal and is therefore considered the tree itself. The Peepal is sacred to the Buddhists as Prince Sidharth received enlightenment under it in Bodh Gaya and became the Buddha. Hence it is called the Bodhi tree or the tree of enlightenment. Buddha reached perfect wisdom under it, so it is called the Samyak Sambodhi or Tree of Knowledge. The Peepal is considered a Brahmin tree and Brahmins offer prayers under it. In Gujarat it is considered a Brahmin itself and invested with the sacred triple cord. It is considered that one who cuts it has murdered a Brahmin and his family will soon become extinct. It is served with food offerings when a male member of the family dies. Some communities believe that the spirits of dead do not get water in the next world. The Peepal is considered a pathway. So water is poured on its roots on three day of the dark half of Kartik (mid October to mid November) and Shravana (mid July to mid August) and on the bright half of Chaitra (March end). Manasa, the goddess of serpents, worshipped in Bengal, is said to live in this tree. Lord Krishna was shot by a hunter’s arrow while he sat under the Peepal tree. *Also read another case on Ficus: If You Help Me God Will Help You: A case of Ficus religiosa published in the Links Volume 18,3/2005 139-142. * An Immigrant and a Native in the World of Mango: Towards an Understanding of Ã‚Â§131-132 (Links Volume 19 1/06 :37-41 International).